Stephanotis is a favorite plant to grow on fences or trellis. It has a vining habit and will fill in a chainlink fence quite nicely. 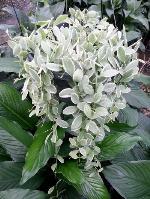 The dark green foliage is contrasted nicely with bright white clusters of fragrant flowers. The flowers are often used for Lei and by florist for use in weddings due to the color and fragrance. Stephanotis has a flowering season of March to October. This trailing plant makes a graceful hanging basket, placed in filtered shade. The white varigated leaf edges contrasts well with it's silver-green centers, and the succulent texture gives this plant a unique appearance for the interior.